If you're looking for some extra practice SC questions online, you are welcome to take a look at these 110 questions - all complete with video explanations. And yes, all of these questions and videos are available on the GMAT Pill HD iPad app - which is free. Stay tuned for the iPhone and Android versions later in December. If you're looking for some extra practice SC questions online, you are welcome to take a look at these 110 questions - [color=#ed1c24]all complete with video explanations. Why dint you post this a few days ago? I think the questions were made available earlier just the video explanations have been recently added also if you create a login you get to practice the other sections DS, PS, IR etc with a free online error log. nelz007 - thanks for noticing. Actually we are still in the process of releasing additional quant upgrades - we released 1 set of upgrades but will also be releasing several more - glad you are happy with them. Vips0000 - note that these videos are also viewable on our iPad app (search "GMAT Pill HD" in the iPad app store. Instructions here. 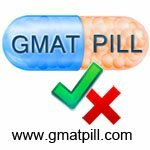 --and as of today, they are also viewable on our iPhone app (search "GMAT Pill" in the iPhone apps tore. Here's how to download the iPhone app. Sweet! even more upgrades good to hear!